Having a professional website design for your business is not enough. With the ever increasing competition online, just investing in a site wouldn’t do any good to your business. Remember, you’re one click away from oblivion. And if you fail to update your website as per the ever-changing standards and algorithms of search engines, your otherwise professional website will be penalized. Well, if you suddenly notice that your website has dramatically dropped in terms of prominence on the search engine result pages. Or, if you experience other adverse effects such as loss of traffic, sudden increase of bounce rate and a dramatic drop in the number of unique visitors. These are just some of the signs that Google has penalized your website. But Google does not convey any message and gives no reasons before or after penalizing your site. This baffles website owners as they are left on their own to find out the signs that their site has been penalized by the search titan. 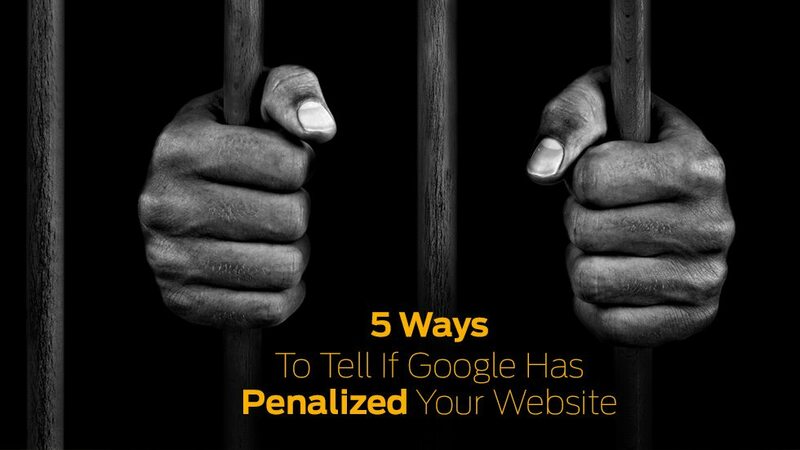 To help you, here are major 5 ways to know if Google has penalized your website. Google Does Not Rank Up Your Brand Name – Just google your company’s name or brand name. If the name is not on the first page of the search results, it shows that something is wrong and there may be possible that the search engine has penalized your site. Your Home Page is Not Listed First – Ideally, home page of your website should be the first listed on search results. But if its other pages are listed first and home page takes a back seat, it shows that the page has been penalized for some reason. Sudden Drop in Your Site’s Position – If your website’s position has fallen from number one page to second or third page, it is probably due to penalty levied by Google. It is definitely a reason if the site drops despite no major competition from other sites. Your site’s Page Rank is Zero – Once you find that your website’s Page Rank is zero, it shows that Google has penalized you. A reason for this could be that your inbound links are dubious and so they are all removed. You Cannot Locate Your Website – If you cannot find your website via Google search [yourdomain.com], be sure that your site has been penalized. The sooner you know that your site has been penalized, the sooner you can take necessary action to revitalize it and make it more Google-friendly. Iron paper reveals that to establish and maintain an effective web design, you must ensure that everything on your website from color to images and the overall voice in the design is Google friendly. Also, it pays to refrain from the common website mistakes small-business owners make. Equipped with this information, you can easily save your site from being penalized by Google.